My talented wife Amy Eian put together a beautiful slideshow based on the gorgeous photos Chad Holder took. You may find the gallery by clicking on this link or the image above. 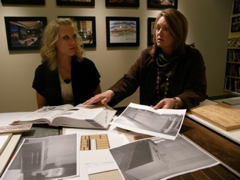 Please join the team, Room & Board, InUnison Design and Partners 4 Design for the interiors event today from 1 – 4 pm. Take a tour, meet the designers and learn about the home’s carbon-neutral design. RSVP through Room & Board’s website. Posted in Announcement, Event, Interior Design | Comments Off on Interiors Event Today! This week has been full of activity – inside and out. There seems to be a craftsperson or contractor in every room as we near the big finish for the upcoming Midwest Home Tour. 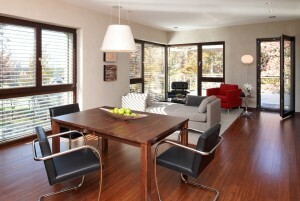 The Passive House is being sponsored by Midwest Home as a wonderful example of green living. The free tour takes place on September 18th from 1-4. Many of the house’s sponsors are working hard to have the house in tip top shape. As the project nears completion, the design we created seems to materialize right before our eyes. The USON tile was delivered this week and is currently being installed in all three bathrooms. The wood floors, cabinets and counter tops are in. Lighting and furniture will be installed this next week. As these items are installed the project moves quickly from a work site to a living environment.nEven our patios and decks will have furniture to enjoy the vast St Croix views. As with all projects, there is much to be accomplished in the last couple of weeks. I have included two renderings completed by Erin Heikkinen, a designer at InUnison Design, Inc. They demonstrate the design concept of this wonderful home and give a taste of what you will see when you visit the Passive House in the Woods. The structure for the PHitW has been underway for sometime now. Windows are being delivered soon, the ventilation system has arrived and the roof is on. 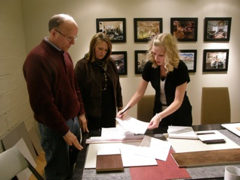 All the while, the interiors team has been working on finish selections that include: Tile, wall treatments, floor finishes, cabinetry finishes, and elevations to detail all of this design. Some of the other details involve lighting and plumbing fixtures, appliance selection, counter top materials, and hardware throughout the home. 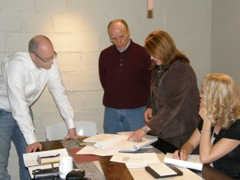 Tim Eian, Gary Konkol, Erin Heikkenen and myself have discussed function, durability, design and cost as all of these details have been massaged into a design concept that is consistent with the original architectural direction. A modern aesthetic is central to the overall design with a strong consideration of function for the home owner. Of course, due to the environmental focus of this project, we have considered many variables when making decisions, ranging from where a product comes from, material and manufacturing process, to what happens at the end of its lifecycle. The interior construction phase is one in which most people begin to understand the design concept, as it is realized inside the home. 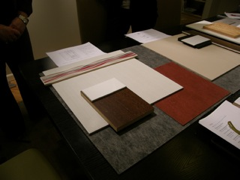 Many hours of meetings with Gary (the client) and Tim (the designer) to finalize the selection of finishes and materials are now part of the construction document package Morr Construction will use in building the interior. 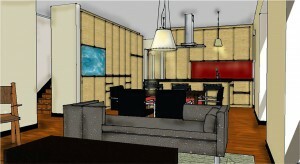 In the coming weeks, I will be posting additional blogs that show interior detailing as it is implemented. 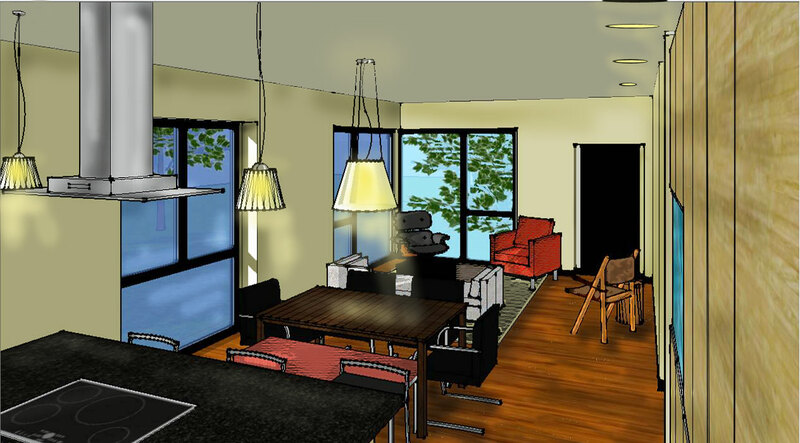 Christine Frisk is the owner of InUnison Design, and the interior designer for the Passive House in the Woods.